The Tasmanian media has been full of details on City Deals in the North and South of our island for the past year or more. Obviously, with the Federal election looming, both sides of politics are keen to impress voters with their long-term plans for Greater Hobart, as well as Launceston, Devonport and the rest of the North-West Coast. What impresses the TCCI is the long-term nature of the strategies, with Federal funding stepped out over the coming decade. At the very least, this gives business Statewide certainty to invest in equipment and people. One could argue that the Hobart City Deal omitted several development opportunities, including the University of Tasmania’s proposed STEM Hub and the overall Macquarie Point project. Perhaps one of the key aspects to the City Deals announced in Hobart, Launceston and Devonport is that they bring together the three levels of government, making them work together. The other major development is what UTas has ultimately planned for Hobart, Launceston and Burnie. 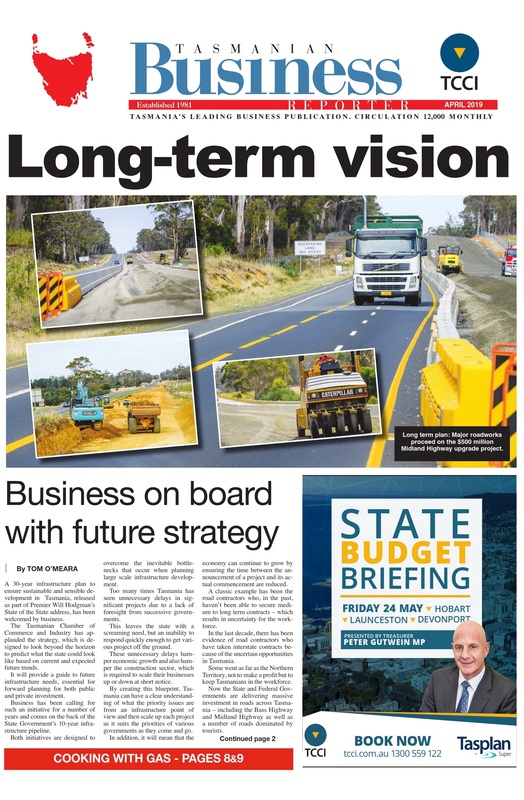 There is no doubt that the Launceston City Deal will transform the city. UTas’ move from Newnham to the city will drive the economy of the city for a decade or more. The social impact of having smart, young people en masse in the CBD will be transformative. Devonport’s Living City program, although not a City Deal like Hobart and Launceston, is a great example of strategic work by both State and Local Government to achieve an outcome for the city that would not be possible for the city alone. Devonport’s Living City will transform the North-West centre through the creation of new retail, business and waterfront precincts focused on highlighting tourism, arts, food and services. The Living City will benefit the entire North-West and is estimated to generate $250 million in construction investment over the next decade and provide up to 830 on-going jobs. Devonport Online, Council offices and an 800-seat conference centre. The Hobart City Deal is a 10-year vision between the Australian and Tasmanian Governments and the Clarence, Glenorchy, Hobart and Kingborough councils. The Deal focuses on enhancing Hobart Airport’s role as a direct international gateway, solidifying the city’s world class standing as a gateway to the Antarctic and Southern Ocean and establishing a reliable, sustainable and cost effective transport system. In Launceston, the Australian and Tasmanian Governments and City of Launceston are cooperating to deliver integrated investment and practical actions that build on Launceston’s strengths and tackle key challenges. This five-year plan will maximise Launceston’s potential by focusing on jobs and skills growth, business, industry and population growth and innovation and industry engagement. As well, its other key focus is a healthy Tamar Estuary, which has eluded successive State and Local government for decades. The City Deals, coupled with the University of Tasmania’s urbanisation in Hobart, Launceston and Burnie will change the face of the State. They are not the silver bullet to all of our issues, but they are committing current and future Federal and State Governments to long-term investment in Tasmania.